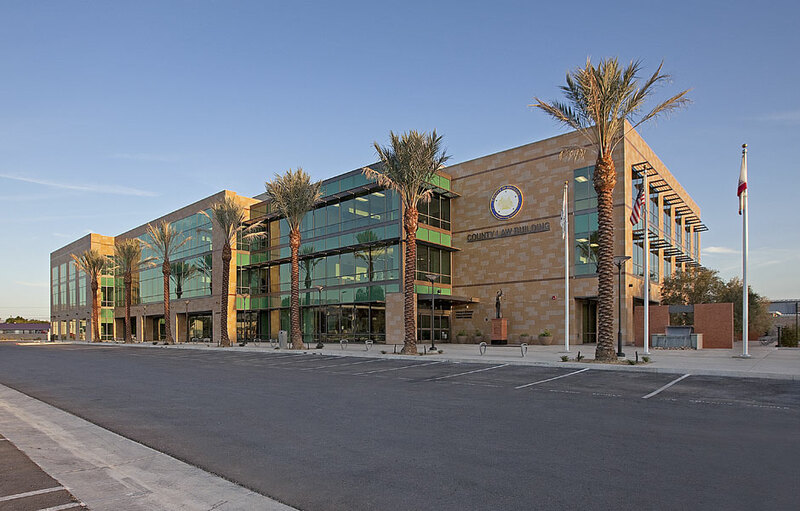 The Riverside County Law Building located in Indio, California is a three-story, steel-frame county office building. Completed in December 2014, the 90,000 square foot building houses the offices of the District Attorney, Public Defender, County Counsel, and staff members, as well as the County Law Library. The project includes a finished pad with stubbed utilities and related improvements to accommodate future construction. A surface parking lot with 369 parking stalls provide parking for staff and visitors. The lot is covered with a state-of-the-art solar panel array, providing 25 percent of the building’s electrical energy and shaded parking. Other green features include recycled content and low-emitting building materials, drought resistant landscaping, electric charging stations, and energy and water-saving features. The County Law Building was delivered using the American Model Approach to public-private partnerships, the second project to use this model in California and the 37th nationwide. This innovative development model utilizes privately-issued tax exempt bonds to finance the construction of public infrastructure. The $38.6 million project was too small to be financed using the typical DBFOM model or International Model. Using the American Model allowed for Public-Private Partnership Delivery of a smaller scale project to a community that otherwise would not have been able to take advantage of the savings delivered by private sector expertise. For this particular project, a not-for-profit affiliate of National Development Council issued tax-exempt 63-20 bonds to finance all project costs. A high bond rating was achieved based on a long-term lease of the completed facility to Riverside County. The not-for-profit owner then contracted a private sector development team to design and construct the facility. The team, which included Trammell Crow Company, Langdon Wilson International, and Millie and Severson, provided price and schedule guarantees in return for incentives for reaching project milestones on schedule and for achieving project savings. By leveraging the efficiency of private-sector development techniques, the team was able to complete construction in just 12 months, 4 months ahead of schedule, and $4.2 million under budget. The savings was shared by the development team and Riverside County. The building is currently occupied by County judicial staff and is operated by a private management firm contracted by the not-for-profit owner. The facility is leased to the County for a term of 30 years. At the end of the lease term or earlier if the County opts to retire the debt, ownership of the building will revert to the County. It was essential that the team selected to develop the County Law Building would be able to meet Riverside County’s high expectations for design and sustainability. The team, led by Trammell Crow Company, achieved this by employing a number of strategies to creatively reduce the building’s carbon footprint and is the first Riverside County government facility to earn the LEED Platinum status.